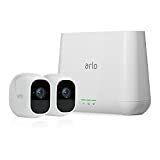 My team and I have spent few weeks on a search for the best wireless outdoor security camera system for home and we have finalized Arlo Pro 2 as the best wireless outdoor security camera system in the market. We have considered a good number of factors before finalizing this security camera. 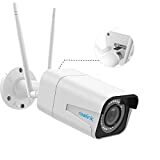 We considered these factors before choosing the security camera: connectivity, weatherproofing, price, storage, resolution, motion sensing, view range, power source. 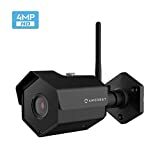 This is your camera of choice if you are looking for something that comes with everything when it comes to your home security. Some of the most interesting features include the 100% wireless connectivity. The camera system is free of cords and any wiring making it hassle-free. It handles extreme temperatures well including rain and heat of up to 122 degrees Fahrenheit. The resolution is also impressive with 1080p HD capability with night vision. The high details are ideal even in the dark entering that you do not miss a moment due to darkness. The home security camera provides flexible powering options such as a wire-free capability, plugged in options and a rechargeable battery. Storage is crucial and cloud storage ideal. The initial buy comes with 7 days of free cloud storage for your convenience. You also get to view recordings, live stream and use the audio for the same length of time without paying a dime. Connectivity: Works with a wire-free set up the battery recharge is also wire free. Weatherproofing: The system is hardy and completely weatherproof working from 32 to 122 degrees Fahrenheit. Storage: It comes with cloud recording options with 7 days free for starters. Resolution: You get a high 1080p resolution with night vision for the dark. Motion sensing: The cameras come with an advanced motion detector that keeps recording until the activity is over. View range: Wide view range with a good resolution. Power source: Wireless plugging with rechargeable batteries. The Reolink home security camera is an ideal option with a high-resolution capture of up to 3072×1728. You get a 1.4x option and 100ft of night vision visibility distance. The 4x optical zoom brings items that need to be detailed closer while enjoying a 98-degree angle. This is a great camera if you have a large compound or backyard. A 2.4/5 GHz dual-band connection with 2T2R Wi-Fi antennas ensures that you enjoy the most reliable network signals all through. The wireless connectivity means you will not have messy cabling running all over the home. The cameras are weatherproof handling rain, heat and wind very well. The motion sensor keeps you well alerted sending you photos on email as well as 30-second clips while supporting FTP upload. This keeps you in touch with everything that is going on in your home real time. The home security camera provides you with a client App that allows you to access the cameras remotely at any time using any device. This includes live streaming. The cameras come with an inbuilt 16GB sd card that records up to 400 motions in storage. Connectivity: Uses a dual-band Wi-FI connection with MIMO antennas for strong reception. Weatherproofing: The build is airtight ensuring that the whole set up is completely weatherproof. Price: This is one of the most affordable home security cameras on our list. Storage: The cameras come with an onboard 16GB SD card that can store up to 400 motion events with a built-in Playback option. Resolution: The 5-megapixel cameras record in super HD 3072×1728. You also get a 4x optical zoom for details. Motion sensing: The cameras have motion sensing and record live on movement saving it directly to an onboard SD. View range: 33 to 98-degree vision is better than it gets covering a good outdoor area. The OOSSXX home security camera comes with a whole array of impressive features including an expandable system. The system comes with 1 by 8 channel 1920×1080 resolution and 4 1080p wireless cameras that are also waterproof. The heavy-duty cameras are ideal for homes and commercial setups. The expandable nature causes bigger homes and commercial places to take preference to them supporting up to 8 cameras at a time. The additional cameras can be purchased separately. 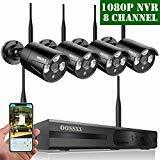 Unlike most of the other home security cameras on this list, the OOSSXX is not battery operated. Each and every camera will need to have a power source. Expanding the set will also require you to get a Wi-Fi extender for the purpose of getting a stronger signal to the rest of the cameras. This will be determined by how far apart the cameras are. The special extender will also need to be purchased separately and does not come with the set. The OOSSXX supports monitoring and provides real-time information to the homeowner remotely using email alerts of snapshots. One of the most interesting facts is that each camera on the whole set can be customized into a different detection mode. The impressive complexity allows the homeowner to tailor make security protocol in the home depending on high risk and low-risk areas around the compound. The easy to set up system also supports online cloud storage through IP Pro. The app also enables the homeowner to monitor live feed from the cameras from anywhere. The system supports wireless and wired connections and this is convenient when one fails. OOSSXX is usually not liable for extra camera set up but will give you support and warranty for one year. Connectivity: The system is wireless using Wi-Fi connectivity. The system is expandable which means that you will need to use an ‘extender’ beyond a certain number of cameras for better reception. Weatherproofing: The high-grade cameras are designed for harsh environments and are also perfect for commercial outfits. They are well sealed for waterproofing purposes. Price: The home security camera is well priced considering its value and grade. Storage: The cameras store information directly to the server as they record of up to 6TB. Resolution: The 920×1080 high-resolution camera captures every detail adequately. Motion sensing: The motion sensors capture and report via email with snapshots, which is ideal for the homeowner. View range: Wide view range for big compounds. The Amcrest IP home security camera provides the homeowner with an ultra HD resolution that leaves no detail. The Ambarella chipset is able to handle 2688x1520p at an impressive 30fps. The latest Sony image sensor allows you to detect even the slightest movements at a 118 degrees angle. This allows you to cover more ground using a single camera at a very reasonable range. The smart security system also sends notifications to your smartphone and any other peripheral device of choice using the Amcrest View App. The recorded events can be watched live and can also be stored on a number of cloud platforms including FTP, NVR, Armcrest NVR, Armcrest cloud, and Blue Iris. The camera will shoot up to 98 feet clearly no matter the weather in the night making it one of the most resilient options on the list. You will, of course, enjoy further distances in clear weather. The cloud storage plan ensures that you do not miss anything when it comes to recording your surroundings. The storage plans are affordable and occasional offers will make everything cheaper at the end of the day. The cameras are simple to install and are FCC and CE certified. The data sent or received is secured using SSL and HTTPS encryption for assured privacy. 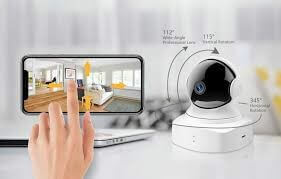 Connectivity: The home security camera used Wi-FI connectivity for ease and convenience of installation and handling. Weatherproofing: The simple and secure system is at the top of its game no matter the weather keeping the vision clear up to 98 feet. Price: One of the most affordable systems on our list of home security cameras. Storage: The camera comes with its own application and cloud storage ensuring that you do not miss a second of recording. Resolution: You get up to 2688x1520p at 30fps thanks to the Ambarella chipset onboard. Motion sensing: Live motion sensing and recording keep you remotely in the know. View range: The high resolution is aided by a 118-degree viewing angle. The Armcrest ProHD fixed outdoor home security camera brings you superior 4-megapixel live coverage at 2688p. A refreshing rate of 30fps is supported by an Ambarella chipset for jaw-dropping picture quality. You get cloud storage from a number of platforms including FTP, NVR, Armcrest NVR, ONVIF, Armcrest cloud, and Blue Iris. Playback on the same platforms is possible. Set up is quick with easy Wi-Fi connectivity to any Android smartphone or peripheral device that supports the Armcrest App. The fixed position of the camera does not allow you to tilt or reposition the pan angle of the camera. The camera is fitted with an IK10 Vandal-resistant casing that is able to withstand high impact. The housing is also weatherproof keeping the camera safe from harsh elements. The camera caters for 118-degree viewing which is ideal for large compounds and backyards. The motion alert system keeps you in touch with emails and snapshots. The camera system is compatible with Chrome and Safari, which all support Armcrest cloud. The Cameras are FCC and CE certified for quality assurance. Connectivity: You get a fast Wi-Fi set up and an Arm crest app for extra features. Weatherproofing: Best camera whether rain or shine with adequate waterproofing. Price: Friendly pricing for great quality. Storage: Cloud storage through the Arm Crest app allows you to record every second and enjoy playback options. Resolution: A 2688P Ultra high video resolution enables you to get every detail from the cameras. Motion sensing: Intelligent motions alerts on email and snapshots keep you notified. You can use other mobile and web apps through Amcrest such as chrome and Safari. View range: The camera comes with a 188-degree view angle for proper visibility especially when you have big fields and backyards. Power source: The server used a power source while the cameras operate on lasting rechargeable batteries. Picking the best security camera out of hundreds in the market was not an easy task. I enlisted a group of experts that have experience working with home and commercial installations. 3 months of research and endless inquiries brought together a list that will fit your needs. The fact that innovation and tech have evolved is one of the reasons why one has to take time to learn more about the cameras. Some of the latest techs are quite beneficial for the purpose of monitoring and executing security protocols remotely. We took to account some of the most crucial aspects of the security cameras and made observations on the same. Some of these aspects included pricing, longevity, build for the purpose of waterproofing, ease of installation, the ability to expand, video quality, storage options and size, support and connectivity. We took into account homes and commercial setups that are already using some of the cameras and the challenges they are having. The result was a compromise of all these factors that would favor the home user specifically. The home user will use different security cameras to those used by commercial setups. The pricing will also be different. Picking the best also involved testing and eliminating the cameras in the market. There was a time security camera had nothing to do with the internet and now this has immensely changed. The best in the market seems to be the wireless ones with a number of advantages. 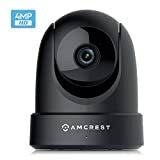 Wireless cameras do not need to be interconnected using physical media such as cables all along the house from the server. Wireless connectivity enables the server to connect with each camera using a wireless signal with quite a number of possibilities. Wireless capabilities enable you to use any device that has connectivity to tap into the feed for the purpose of viewing within the channel. wireless connectivity also allows you to keep your connections neat and tidy. Installation is easier and may cost less at the end of the day. Cables may look untidy and can be affected in case reconstruction or an intruder tamper with them. Wireless connectivity also allows communication between people at the two ends of the camera for the purpose of identification or warning. Security cameras with wireless connectivity also require fewer configurations. They allow the homeowner to access the data from anywhere they are reliably it through a smartphone or remote computer. Wireless connections have also allowed users to give voice commands to the security cameras and have captions relayed for activation. It is much harder to hack into wireless security systems as long as the home user has foolproof passwords and proper security protocols. Home security cameras that are used outdoors are also exposed to quite a number of weather elements. This makes them susceptible to intense heat, cold and rain, cameras that are resistant to all these aspects of weather are best. Your cameras will be spending all their time outdoors and so need to be hardy enough to survive harsh realities. It is quite cumbersome having to shelter outdoor cameras. The sheltered presentation also seems very shoddy and could affect visibility. Outdoor cameras will keep a steady view that is unaffected by changes in the weather. The best cameras are airtight and are also made of the non-corrosive material that is also tough. Bad weather is likely to limit visibility and this should not happen beyond a certain point. Home security cameras will vary in pricing ranging from less than $100 basic cameras to the more than $500 high-end home security cameras. The pricing largely depends on the features the camera comes with. Cheap cameras are not a good idea as they will compromise heavily on a resolution which comes in handy when identifying trespassers. They will also not withstand rough weather which will cost you more in the long run. They will also lack features like wireless ability, proper storage, and motion sensing. A good compromise will be friendly to the pocket without putting your valuables in jeopardy. The type of storage and the options you will have are paramount to accessing the recorded data. The bigger the storage options the better for you when it comes to retrieving evidence. The best way to go about this is by ensuring that your home security cameras have access to a cloud store. Cameras that allow you to access cloud storage will also allow you to access your date from any device that has access to the internet. These come with good data encryption to ensure that your information is safe from hackers. Cloud storages allow you to get a big storage capacity without having the hardware capacity to do so. The service providers charge you for the capacity you need to upload at a time and so an affordable plan is ideal. The data can be erased once it is no longer needed to make room for more data. The older generation of homes security camera took to no account the quality of the video. The refreshing rate was terrible and the quality sad. Things have changed with more powerful chips in the industry providing unbelievable footage. Security Cameras with a resolution above 720p are good to work with. Cameras are now flaunting as high as 2800p if you are looking for something ultra-high. You will, of course, need to front the internet bill for recording that high a resolution. The storage space used will also be higher since the image will be larger. 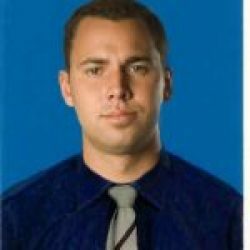 A good resolution is important for the purpose of identifying objects that are moving and so should not be compromised. It becomes of great assistance when you can recognize faces for the purpose of aiding investigations into break-ins and trespassing. Motion sensing has become a valuable aspect of security cameras on two fronts. Motion sensors give you notifications whenever there is movement at the house especially when there should be none. They also make it easier to locate specific times there was activity as opposed to having to playback hours on end of the recording. The best aspect of having motions sensors is the ability to record only when movements are noticed. Cameras with this feature will use lesser storage space compared to those that record continuously. Systems that give you instant notifications in the form of messages or emails should also be highly considered. A system is as good as its alert system. Some will send small recordings while others will send a number of snapshots. The best home security cameras will have a wide view range without losing their resolution. Angles of 118 degrees and above are ideal. The placement of the cameras will also affect this greatly. It is better to have two cameras in the place of one if it means having to place one very high or far to capture a bigger area. You will end up losing details unless the camera has a smart zooming capability. Most are however manual and so may not help in this case. Home security cameras with a plug-in power source are more reassuring but not when you have to place a camera very far from the source of power. This will cost you extra in wiring and power. Cameras that come with batteries are perfect for long distances but are a nuisance when you need to access them and recharge every battery. The best cameras will have these two options to ensure that you are recording even when you have a blackout as long the server has a backup too. The options can also be used interchangeably with those closer using power plugged in and those far away using batteries. This is for everyone that lives or works in any kind of property whether rented or bought. That practically means almost everyone. Your level of security will determine your level of safety and security cameras are on the frontline. Homes without cameras are easy targets compared to those that have cameras. A thief will find it lesser of a chore figuring out the intricacies of a cameras system and so will always choose homes and premises without any form of measure. It is also a great piece for you when it comes to picking the right security cameras. The fact that there are many brands in the market actually makes it harder to pick the best or if you prefer, the right one. Cameras have to be meet some of the most basic criteria which include being waterproof and long-lasting. The build of the brand needs to be as good as the features the camera comes with. Knowledge will make a difference between buying cameras that will keep your home safe and those that will fail at the hour of need. Understanding how cameras work will also give you some pointers on what to ask for at the store. The piece will also help you eliminate some of the options on your list and make a better choice even when you need to compromise. Your only compromise when it comes to security cameras is the pricing. A good camera will not be cheap. Expensive ones will also not always be the right ones and have to be well investigated. Cheap ones may end up costing more. The right compromise takes a professional view which is why this is perfect for you. 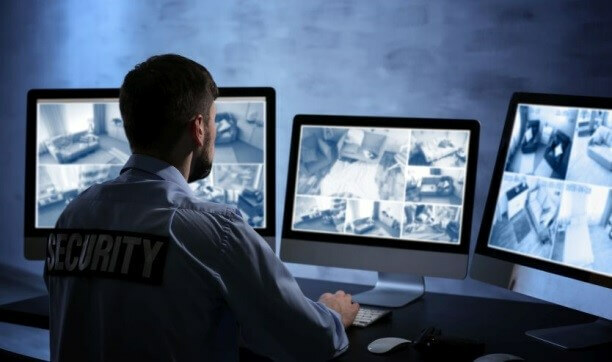 Having worked as a security consultant for a number of years now as well as being a homeowner has exposed me to a number of security systems. Cameras are the most valued security measures in any company, industry or home. I have also dealt with breaches that cameras have detected and been part of cases in court where cameras made all the difference. My experience in installing home security cameras has also exposed me to different brands and types, keeping up with the new technology and innovations. All technology is s good but not all is convenient. Ultra HD cameras are everyone’s dream but may not work for people that have low internet strengths. They may also not work for people with limited storage and so security set up that fits such a home will have to be well thought of. Cameras that have batteries are best for long distance setups but present the challenge of having to charge the batteries very often. Those that need cabling are costly when it comes to running them around the homestead. All these factors are crucial and will determine the kind of camera that you pick from the word go. Cameras that will have options are the best. A camera that will have a little of every challenge will be more suitable for any home without it costing you an arm and a leg. I also work with a huge network of security experts who have taken a keen interest in the kid of cameras they use for their clients. Their vast experience has contributed largely to this piece with hours of research and in-depth knowledge going into it. The best camera for you should be a balance between all the features in the list. Convenience should also be considered when it comes to alerts and notifications. Some will have the option of doing so remotely on your smartphone as well as other devices. These enable you to act on time which is crucial. Extra features will make a difference when it comes to making out details and should also be taken into account. Taking the time to shop and make informed decisions will save you money and also give you a great experience in the long run.